USB CONNECTION — Connects to your laptop via its micro USB connection, which also provides it with power. It’s designed to provide a hi-fi audio experience, presenting your audio exactly as it was intended to be heard by its creators. The Q1 Mark II can operate as a USB DAC when paired over USB with a computer. Nobsound®——Dou​k Audio. Nobsound®——Douk Audio. Nobsound NS-08E Vacuum Tube Headphone Amplifier. HiFi Art-Elfidelity. 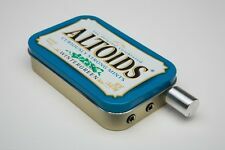 Headphone Amplifier. Hi-Fi Tube Amplifier. Integrated Amplifier. Digital Amplifier. I am an engineering graduate student with a love of all things audiophile. Due to the budgetary constraints of being a graduate student and high prices of many audiophile grade components I began building my own audio electronics. 1 x Headphone Amplifier. Adapted headphone impedance: 10-150Ω. Input/output port: 3.5mm studio input. 1 x Audio Cable. 1 x USB Power Cable. Output power: 40Mw in impedance 16Ω. After you win the item OR place a new order. Condition is Used. I upgraded to the Massdrop THX AAA and no longer need this. RCA's not included. High precision power divider circuit. audio channel all use the United States Army Regulation DALE have a fever resistance Low noise, sound quality is good. Sabaj D1 portable headphone amplifier with build-in dac.3.5mm headphone jack output.D1 also get Optical output can be as a digital convertor. With optical output can be as a mini digital convertor.3.5mm headphone jack output. With the A5, we continue this tradition by striving to significantly improve over our previous products. With the A5, we continue this tradition by striving to significantly improve over our previous products, the E12 series. 4-Channel Headphones Signal Splitter Amp Distribution Sharing Amplifier Box SPECIAL OFFER! If you re tracking more than one musician at once, or if everyone group wants to listen to a playback, you need a monitor distribution system. The compact, flexible PHA40 can power up to four pairs of headphones and up to four independent volumes. Grab this super-compact amp during your sessions to power practically any headphones--four of them at the same time, to be exact. This allows four people in your studio to listen to the main mix while recording and each listener can determine their own volume level using the dedicated output level controls. The PHA40 contains 4 high-power stereo amplifiers that maintain the highest sonic quality even at maximum volume levels. JDS Labs EL Amp Headphone Amplifier in Mint Condition! Used JDS Labs EL Amp headphone amplifier in mint condition. Functions perfectly, sounds awesome. Will drive pretty much any headphone. Comes with everything that JDS Labs sent me (see pics). Also included are Ghent Audio Canare L-4E6S 7-inch RCA cables. Nice short cables to be perfectly paired with the EL Dac. Purchased directly from JDS Labs about 8 months ago. Selling because I need funds. Been selling on eBay for around 15 years, check out my feedback... so have confidence that the description is accurate and honest, and that it will be shipped properly and quickly. Thanks. Volumio will also stream from internet sources via wired ethernet or wifi. The unit is paired with the well-regarded HiFiBerry Pro XLR DAC to bypass the usually-noisy USB audio output path. 32GB micro SD card with latest version of Volumio pre-flashed. This is a Schiit Magni 3 headphone amp. It works great and is in flawless condition. I used it to power a hard to drive set of headphones for a while, but recently upgraded to a set that don't require as much power, so I no longer feel like I need it. Professional Audio Architecture Utilizing savitech's SA9023A USB receiver to decode USB audio and then TI's high fidelity, low noise PCM5102 DAC chip, which outputs to the TPA61332A headphone driver. 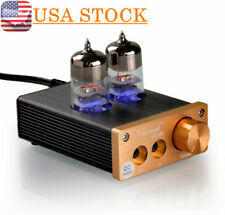 Hifi Lossless Stereo Audio Amplifier Mini Headphone HIFI AMP Headphone Amplifier. 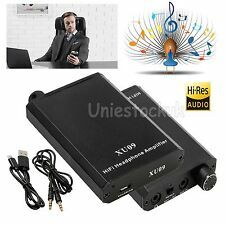 Portable 3.5mm AUX Interface Stereo Audio Portable Mini HiFi Headphone Amplifier. Lithium Battery Capacity: 2000mAH. 1 x Headphone Amplifier. Bass Traveler is a portable headphone amplifier with two 1/8-inch headphone jacks that lets two people listen at the same time to the same signal. Many personal digital music players have a limited output for driving high-quality headphones - which may have a higher impedance, a lower passband voltage sensitivity or both--but Bass Traveler has a 2-level gain switch to boost the signal level, so the sound is always crisp and clear. It is ideal for use with virtually all headphones from 16-100 ohms. The sound quality from the typical headphone jack on a portable device or coming from the standard-issue soundcard found in virtually every computer leaves a lot to be desired. It also has a jack for plugging your MP3, MP4, for iPod or CD player. Type: Stereo Amplifier. Smart, lightweight aluminium casing. 1 x Stereo Amplifier. Jack Input: 1/8" (Standard Stereo Jack). Input Impedance: 47K. Up for sale Monoprice Desktop Headphone Amplifier. Fully functional and great sounding. I believe this model shares internals with FiiO E09K amplifier. It can accept analog signal from RCA inputs, or you can connect it directly to PC using USB cable. Deliver the highest audio quality with virtually all types of headsets and earphones include the larger over ear headphones even at maximum volume; Adding an amp between the player and your audiophile headphones can provide a significant, audible improvement in clarity, detail and dynamics Volume control with Power Switch - Smooth rotating analog knob for easy operation and precise volume settings; Reach beyond the limitation of your earpiece Flexible output option of 3.5mm or 6.3mm stereo jack; Support Stereo 3.5mm or RCA Input. SPL Phonitor Mini Premium Headphone Amplifier Home Hifi Studios. Condition is Used. A couple scuffs in the extruded silver part of the faceplate but looks clean otherwise. All functions work. Very comprehensive crossfires features. Sounds great but I’m saving up for a better solid state amp. 4 Chanel Headphone amplifier with 5pcs adapters, Headphone amplifiers are specifically designed for headphoneand are used primarily to push high-power, high-impedance headphones. SupportS 10-150Ω Headphone, 6.35mm AUX Input and Output, SNR>100Db and THD N 0.0003%, Make it Possibility to Output not just Louder Sound, but a Sharper and More Real Stereo Sound without Distortion. 4-channel stereo headphone amplifier HA400. 4-channel stereo headphone amplifier for all types of headphones. 1pc x Headphone Amplifier. Each channel has output level. Ultra low-noise 4580 operational amplifiers ensure superior tone. Rolls HA43 4 Channel Headphone Amplifier. Condition is Used. Shipped with USPS Priority Mail. Excellent condition, everything works as new. This is a high-grade USB digital to analog converter with built in headphone amp and pre-amp. Enough power to easily drive audiophile grade headphones, works at 24 bit 96khz resolution; so it is compatible with FLAC, ALAC and high quality streaming services such as Tidal’s Masters. Schiit Magni 3 amp, only used for about a month and a half. I have since moved on to more expensive equipment. Works great, will ship in original box along with AC power cable. I am also selling the AKG K712 Pro headphones I used with this amp if interested. Audioengine D1 24-BIT DAC. RCA preamp outputs. Sennheiser GSX 1000 7.1 Channel Amplifier (used) (great condition). Condition is Used. Shipped with USPS Priority Mail. My name is Zachary and I just got a new headset and amplifier. I am selling the gsx 1000 because I no longer need it. This amplifier is in grear condition and comes with the amp itself and the cord. Condition is Used. This was my first step into improving sound quality of my music. You will need to go the their website to download the drivers. The USB cord provided started fraying (and was really short), so I upgraded it with a good quality USB (pictured, and I will include.). 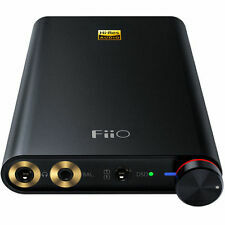 It's a good DAC/AMP for using in office, it's good to drive HD600, Fostex TH-X00 and IEM. Chord Electronics Hugo 2 DAC, Preamp and Headphone amplifier. Silver colour. Frequency response: 20Hz-100kHz ( - 1dB). Rated output power: 800mW 800mW (32 ohm load). Sensitivity: 500mV (gain H). Weight: about 185g. Size: 136x63x15mm. Lithium battery capacity: 1000mAh / 11.1V. Sennheiser HDVD800 Headphone AMP/ DAC /Pre Amplifier . very good working. Chat Link - connect up to 8 GSX 1200 PROs together for hard-wired lag-free communication. NuForce Icon-1. Condition is Used. Shipped with USPS Priority Mail. SPL Auditor Headphone Amplifier Silver. Condition is Used. Shipped with USPS Parcel Select Ground. Adult non-smoking audiophile original owner. This amp has a DAC with digital USB input, analog RCA inputs, analog RCA outputs, and a 1/4" headphone output. It can drive virtually any headphone, producing > 1 watt of clean power into 33 Ohms, with selectable high/low gain to match headphones of any impedance and efficiency. AudioQuest DragonFly 2-Channel USB DAC/Preamp/Headphone Amplifier - Red. Condition is Used. Shipped with USPS First Class Package.